James Willard Larson, age 84 of Elbow Lake died Thursday, January 18, 2018 at the Minnesota Veterans Home in Fergus Falls, MN. James Willard Larson, age 84, was born November 5, 1933, at home in Sanford Township, Elbow Lake, Minnesota, the eight child of Ole H. and Alma (Johnson) Larson. He was baptized and confirmed at First Lutheran Church in Elbow Lake. He attended country school and then graduated from Elbow Lake High School in 1951. After a few years of working on the family farm, James entered the U.S. Army in 1954. He served in the Engineers as a Construction Machine Operator, building roads in the area around Kaiserslautern, West Germany. After being honorably discharged in 1956, he returned to the family farm where he worked and lived for the next 44 years. Jim was married to Ivadel Chayer on August 30, 1958 at Lien Lutheran Church in Barrett, Minnesota. They became members of United Lutheran Church when it was founded that same year and had been members ever since. After marrying, Jim and Ivadel moved into the family farm house and together raised five children. Jim and Ivadel later moved from the farm to Elbow Lake in 2000. Jim’s primary interest was farming. 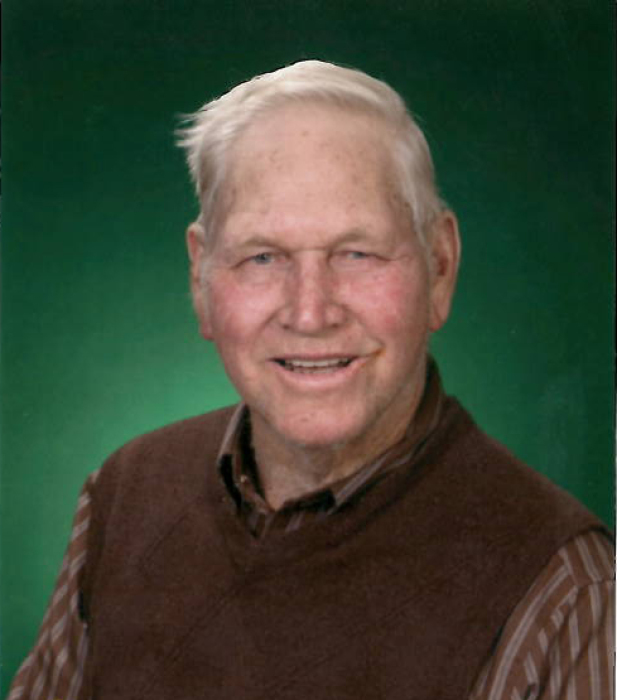 His passion for farming was evident in the straight rows of corn in his fields during the spring, his barn and sheds stacked to the rafters with hay during the summer, his bins and silos full in the fall, and the top-bid feeder cattle that he raised all year around. Jim served his community by being on the Elbow Lake School Board, the Sanford Township Board, and the United Lutheran Church Board. He was also active in the Elbow Lake Jaycees and was a long serving member of the American Legion. Jim is survived by his wife of 60 years, Ivadel, as well as their five children, and six grandchildren: Cindy Larson of Chicago, Brad Larson of Elbow Lake, Brian Larson and son Jacob of Breckenridge, Allen (Lisa) Larson and sons Nicholas, Matthew, and Joshua of Savage, and Dean (Marlene) Larson and sons Layton and Caleb of Maple Grove. He is preceded in death by his parents, his three brothers, Orvin, Ralph, and Loren, and four sisters, Harriet, Doris, Dora, and Sylvia. Visitation: 1:00 PM - 3:00 PM Sunday, January 21 with a Prayer Service at 3:00PM at Erickson-Smith Funeral Home, Elbow Lake. Visitation will resume one hour prior to the service at the church.